Lipreading Mom has a love-hate relationship with wearing ponytails. I love them because they keep my hair out of my mouth when I’m eating. I love them because they keep my face, neck, and shoulders cool in the mid-July humidity. I hate ponytails because I have a square-shaped face that looks like a box without flowing hair to soften it. I once hated ponytails because they revealed my behind-the-ear hearing aids to the whole world. How embarrassed I became at people’s double-takes at my aids, how vulnerable at showing this much of myself, how… exposed. Today I know better. It’s 95 degrees with a heat index of 110, and I have to love my ponytail. My hearing aids sit proudly behind my ears, my hair bunched up and twisted into a rubber band. To attempt to engage in a conversation with my kids, husband, or neighbors in the heat of the day without said ponytail and aids would be a disaster. To engage in friendly banter with the bank teller, store cashier, or any person on the street would be a struggle without my exposed, unaided ears. For the record, I like my hair. I like it a whole lot more than my squarish face and flawed ears. For the first few years after my hearing loss diagnosis, that hair hid my hearing aids and boxy chin. I wore it long and in my face. It was my mask. No one would stare twice at my hearing aids if they couldn’t see them. Long hair combed over my ears was the style of choice in winter, fall, spring, and the hottest days of summer. If I had to wear a ponytail back then, the hearing aids came out. I didn’t want them to ever be seen by anyone but me. The same people who couldn’t see my hearing aids and didn’t know I couldn’t hear well may have wondered why I didn’t answer their questions. If they couldn’t see the aids, they may have assumed I was rude, prude, or just plain stupid. They had every right to since they didn’t know what only I knew. (I can’t hear well.) They couldn’t see what only I could see (hearing aids). Living with my mask of hair was usually easy. I did it almost every day for six years. But sometimes that mask was too much work to maintain; the thick hair to brush and style just so-so, to carefully hide any hint of ear. Wearing the same hairstyle year after year became boring. And uncomfortable when eating or being out in the wind and attempting to enjoy a hot July day. Awkward. Difficult. Confusing. Wrong. Finally one day, I decided to pull my hair up, put my hearing aids on, and walk outside. Here I am, World, take a look. Lipreading Mom has learned to love what she used to hate. 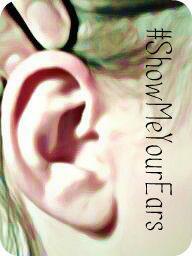 With hearing loss, being exposed is better than hiding. Take a look: I’m the one with the shaggy ponytail, box-square face and exposed hearing aids. Do you think I’m beautiful? This was great Shanna! And I do think you are beautiful, inside and out! You are the perfect kind of person to wear Hayleighs Cherished Charms. She is a little girl with a hearing aid that created this and started her own business cuz she didn’t want to hide her hearing aids. She makes charms for hearing aids and Cochlear Implants and earrings. Her twin sister makes necklaces and their younger sister makes bracelets. They are awesome little girls. They had a booth at the HLAA convention. Check it out. Hayleighscherishedcharms.com. This is Hayleigh, from Hayleigh’s Cherished Charms. Thank you so much for sharing my business with Shanna Groves, I really appreciate it! I just read this post for the first time and I can relate really well to what she is saying about hiding her hearing aids. It doesn’t feel good to feel like people think wrongly of you when the real problem was that you couldn’t understand them. Having this business has helped me and a lot of people to not hide their hearing aids anymore. It feels good not to hide anymore. That’s awesome Shanna! I’m so excited that you bought from Hayleigh! I just bought some more charms and a pair of earrings from her. They are such awesome young ladies! Can’t wait to see which ones you bought! I must be weird, but if I could I’d have my hearing aid flash like a beacon. I am sooo tired of people who have been told a thousand times that I have a hearing problem forgetting it. I wear a BTE and no one ever seems to notice it. I’ve had hair so short I could pass for a marine and no one noticed it. I had to take it off and wave it in the face of the disability coordinator at my law school, who kept telling me I did not have a problem hearing. Then again, I’m a huge advocate for normalizing the wearing of hearing aids. I think people should be encouraged to wear them and be proud of the fact they are doing something proactive.